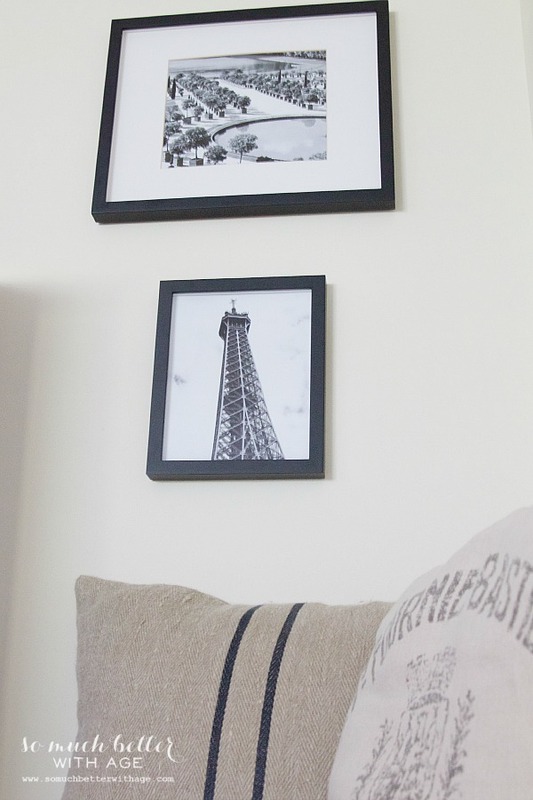 I framed some beautiful Paris artwork which matched my French decor my house! I’ve been busy changing around stuff at home to keep busy. This corner in my bedroom never seemed right. The master bedroom is so large but with lots of doors (two entrances) so it’s a bit of a challenge to hang artwork. 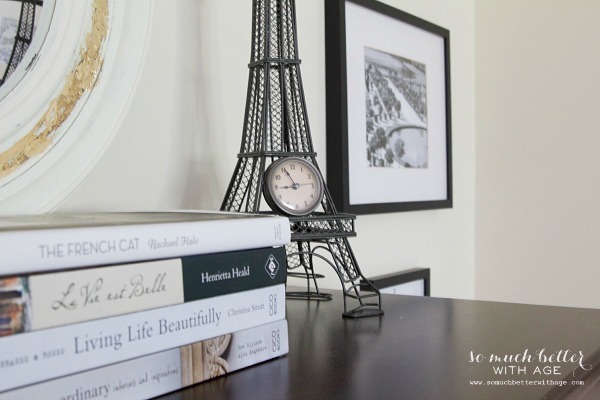 I added some new Paris artwork from my friend Rachel’s Etsy shop. Her photography is gorgeous and creative. Be sure to enter the giveaway at the end for your own print! 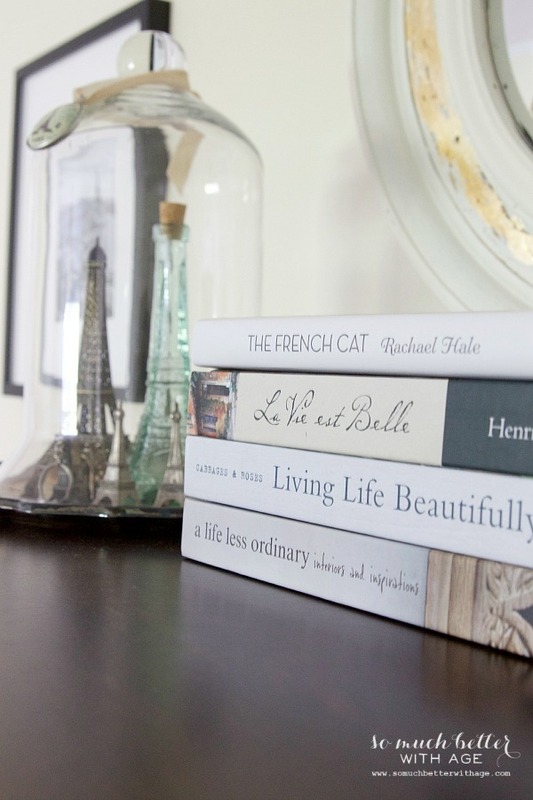 Rachel from Maison de Pax has a beautiful little French blog and now a beautiful little Etsy shop. I love the images she took while she lived in Paris. Matches my French decor perfectly. I had this print from Venice framed years ago and recently I found the little black and white photo at an antique store. I love this one of the rooftops in Paris with the Eiffel Tower off in the distance. 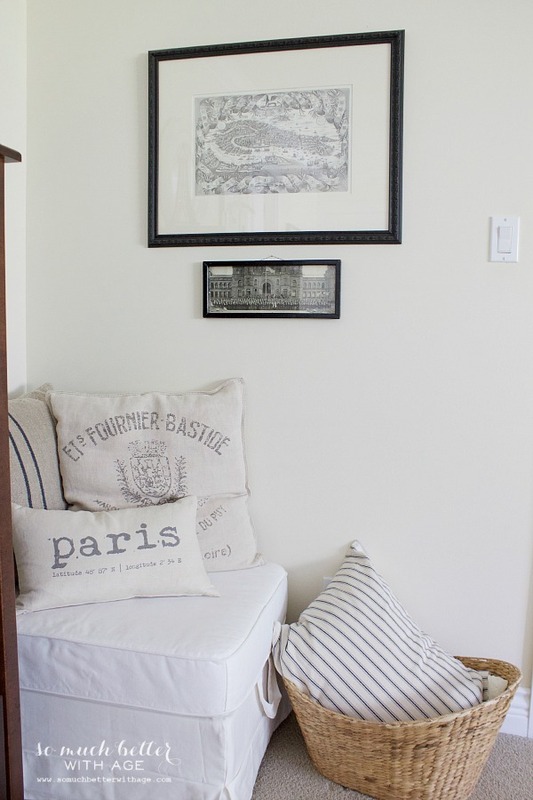 I created a little nook by moving the footstool over here and adding pillows. This is where the stool used to reside, in the other corner of my bedroom. And this is a print Jenna gave me from Christmas. 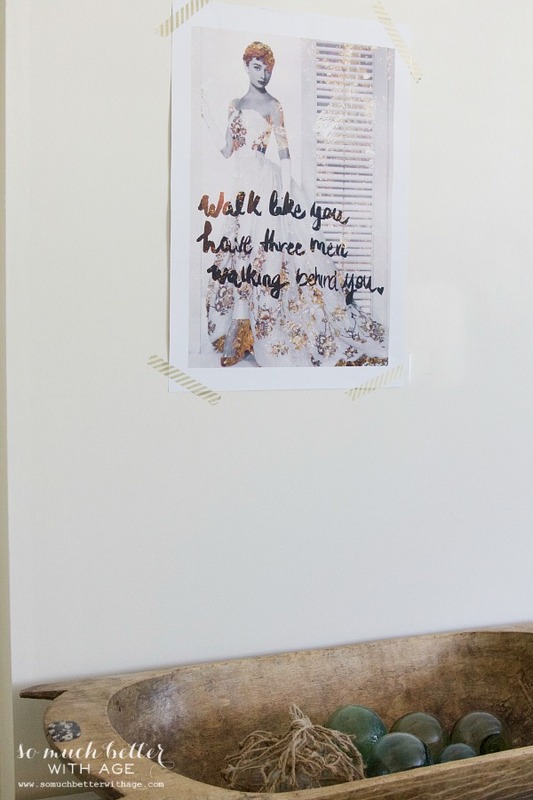 I still haven’t gotten it framed yet, Jenna, but the gold washi tape looks good, right? 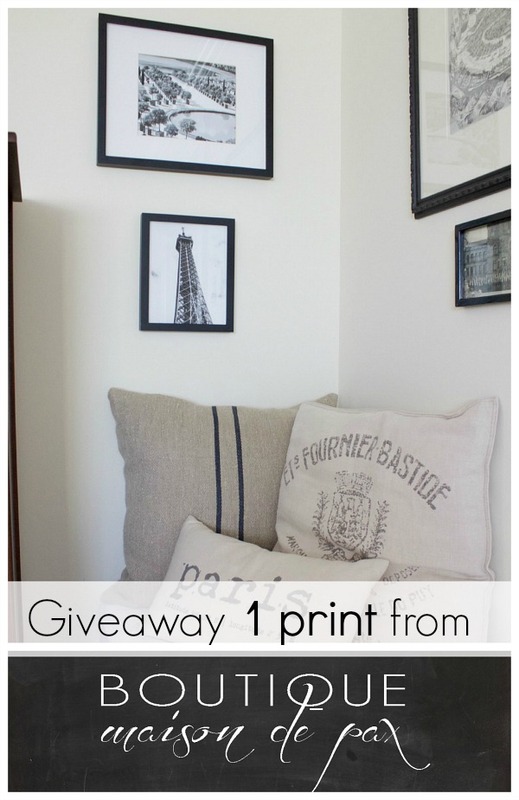 Okay, so now is your chance to win your own creative print from Boutique Maison de Pax! All you need to do is visit the shop and leave a comment below saying which print is your favorite. It was hard to choose just one, but I think Chateau de Chenonceau Bridge is my favorite! So beautiful. Beautiful post Jamie. Love the black and white architecture photo’s. Paris rooftops is definitely my fave. The photos are beautiful. My favorite print is the black and white of a french cloister. My favorite print is the “Rooftops of Paris” I love this view of Paris. what a magical place! All of her prints are so pretty! I love the Cherry Blossoms so much! 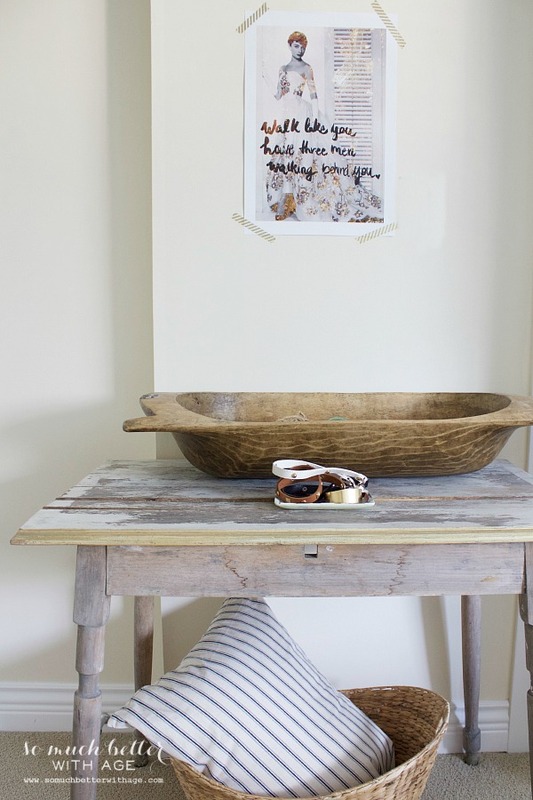 Love Rachel’s photography and prints! And your vignettes are lovely! “Chateau de Chenonceau Bridge” is my favorite because Chenonceau is the name of my street and I celebrated last Thanksgiving in Paris! 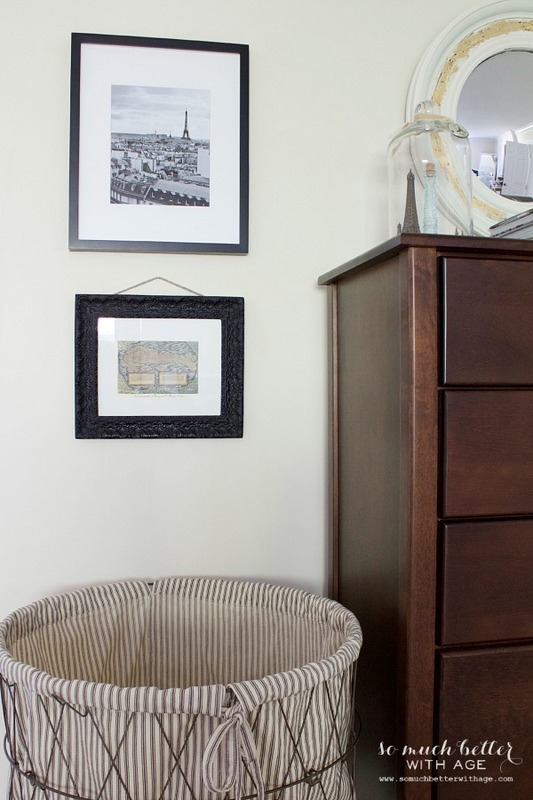 Her images are gorgeous and look perfect in your home. Love the cherry blossoms. Just beautiful! FUN place to shop! I could easily get in to trouble if I lingered too long! I loved the flowering trees…..beautiful picture with just the right amount of black and white AND color. And I love the nook you created with the footstool and pillows…….I have a footstool and an empty corner……….so I am off to play! Thank you! impression, the Chateau de Chenonceau Bridge is my favorite. You did a great job moving things around!! 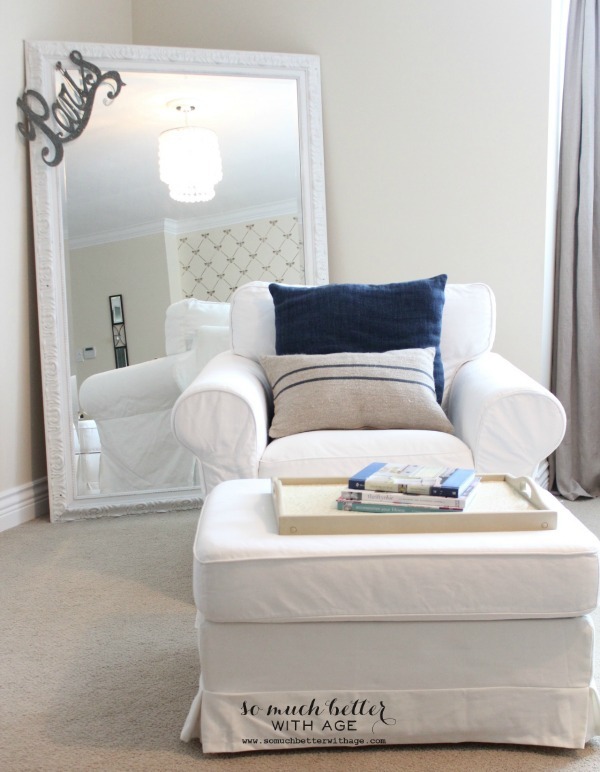 I especially love the big mirror!! My favorite is the vibrant yellow and red flower!! Love the pale pink tones in the Cherry Blossoms in Montmartre. All the prints are lovely. We always enjoy visiting France and of course Paris. Either the Paris rooftops or t5he Eifiel tower would be a real treasure. Beautiful work of very romantic special place. Oh so pretty. I like the French cloisters or the chateau de chenonceau bridge in black and white. I’d love to win any! Thank you. I follow you on IG but this is the first time to the blog. I’ll be back! What beautiful work. I love them all but my favorite is the “rooftops of Paris”. 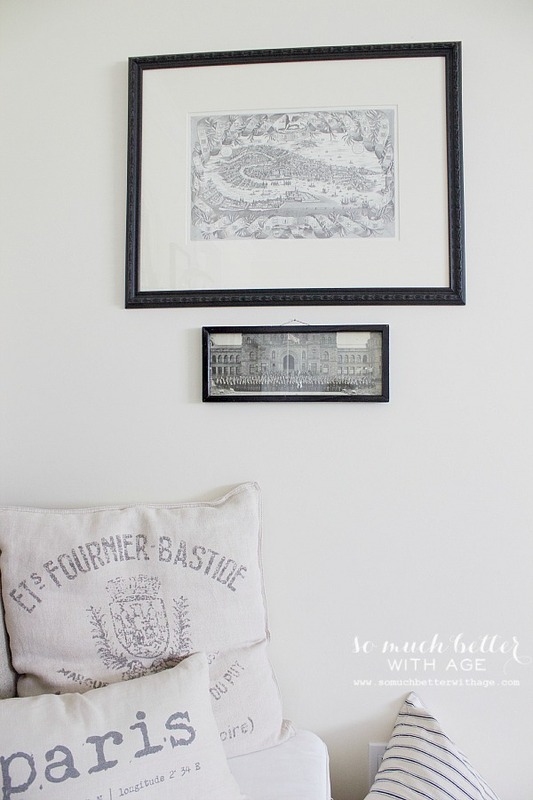 I love the French Cloister architectural print! Gorgeous! My favorite is the Chateau de Chenonceau Bridge! 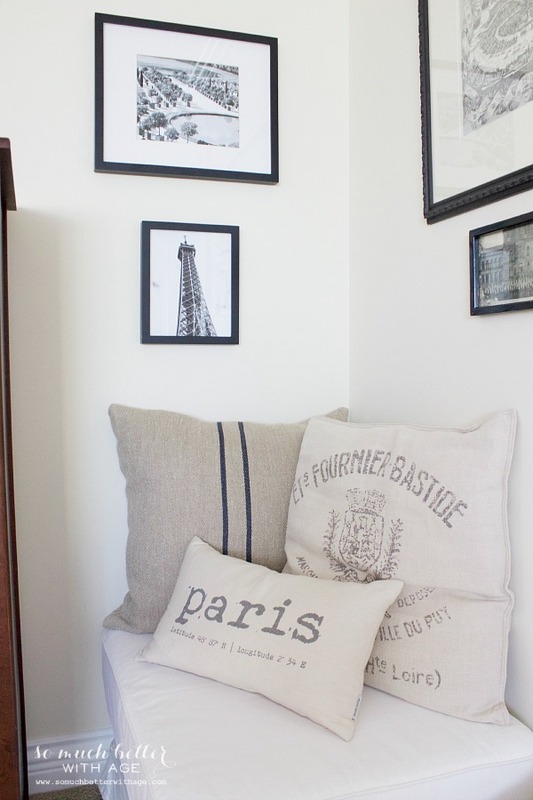 Your little corner of Paris is so lovely – great idea with the cloche and towers. I really like the print of the rooftops of Paris – reminds me of a visit to Paris many, many years ago when I was much younger and only interested in going to clubs and the nightlife. Oh, if only I loved the flea markets then as much as I do now! J’ADORE the black and white of the French Cloister! But they are all gorgeous. Merci! I love the Flowering Trees in Senlis, but all are are fabulous. is fabulous. Thanks for a chance to win. I love the Cherry Blossoms in Montmartre! Thank you for the giveaway! I love the print Monet’s Water Lilies. So hard to choose! I love Cherry Blossoms in Montmartre and also Flowering Trees in Senlis. So gorgeous all of them…. My favorite is the Black and White Chateau de Chenonceau Bridge! Thanks! I love architectural prints! I’m longing for the black and white Chateau de Chenonceau print. 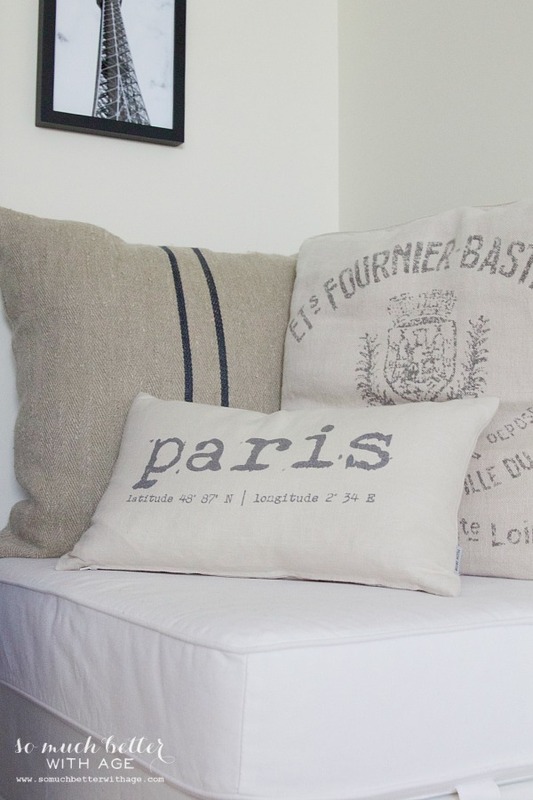 Love your taste in French design. Cozy, homey, with simple elegance. All the prints are beautiful but the Rooftops of Paris is my favorite. We spent time in Paris this past summer and rented a rooftop apartment in the Marais and I spent many afternoons sipping wine and enjoying the rooftops from our window. My absolute favorite is Cherry Blossoms in Montemartre. Love it! I love your special corner you’ve created. 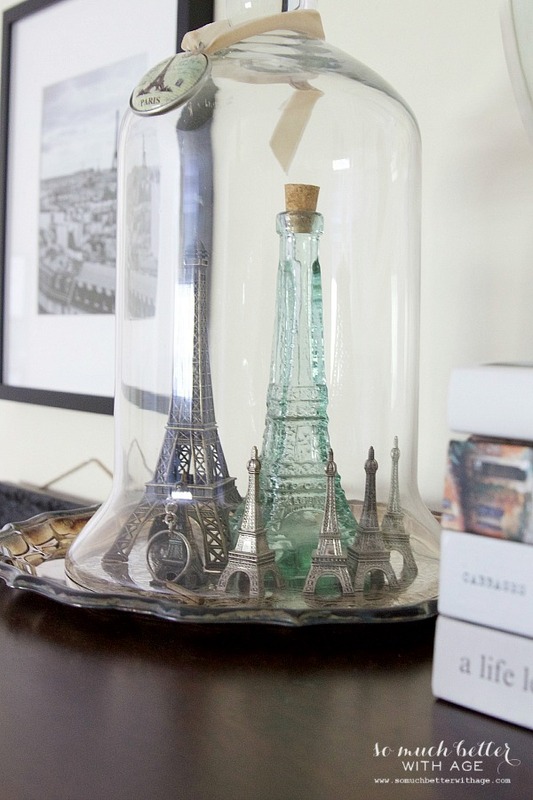 The Eiffel tower collection under glass is eye-catching. I have several myself and will have to try that. It was hard to choose just one favorite, but the rooftops of Paris will have to be the very favorite. (Flowering trees was a close second.) Thank you for this giveaway. I believe Maison DePax is my favorite with the crumbling wall and tower in the background, but I love all of them and pray I get to go to Paris some day! I also love your room! The rooftops of Paris is gorgeous. 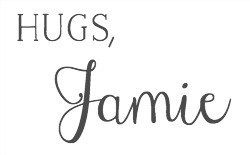 Love the collection in your bedroom, Jamie! Flowering Trees in Senlis. Beautiful. It just says spring. Chateau chenenceau bridge is my fave! So many wonderful prints, but Oh my, I have to choose “Rooftops in Paris”! Soooo beautiful I love them all. I am partial to Black and white so I think if I am forced to choose :0) the Black and white French Cloiste, but again I love them all. Thank you for guiding me to this shop. Beautiful photography – she’s so talented! 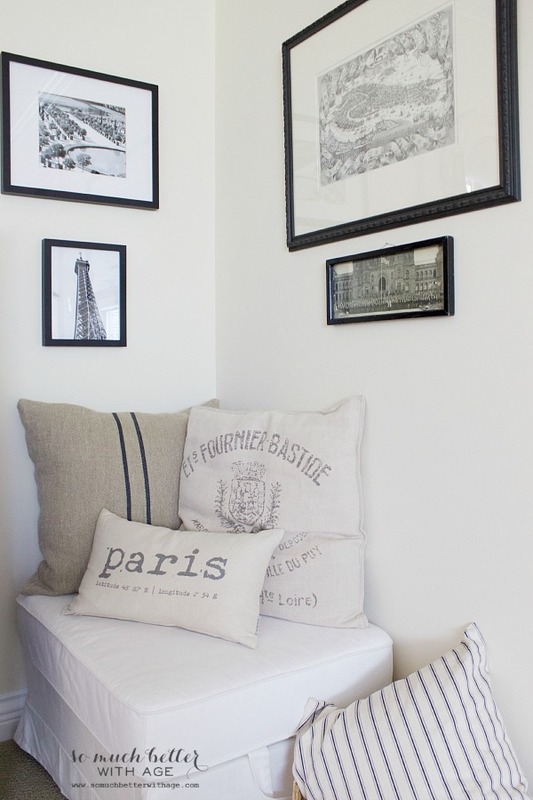 I love the Top of the Eiffel Tower print; very nice! My favorite is “Cherry Blossoms in Montmartre”, especially the one with more muted tones. I can see myself walking here in the springtime.